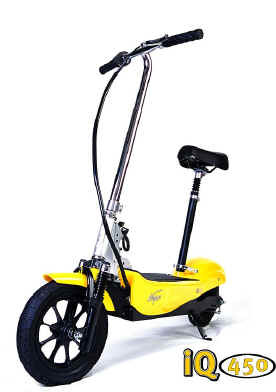 Priced at $529 Quality Scooter! Racing to class or to be with your friends, the Vego iQ450 gives you speed when there's no time to spare. Light Powerful, and portable, the all-new iQ was engineered by really intelligent people who somehow thought of everything. A long-lasting detachable battery for hassle-free re-charging; enough horsepower to cruise at up to 15 mph; and drum brakes that'll get you stopped on the steepest hill. Simply, the smartest way to get around.